Europe has paid close attention to Italy in recent months, in the wake of an inconclusive election that created much uncertainty. In Modern Italy in Historical Perspective, Nick Carter takes a close look at Italy’s troubled history, tracing the roots of current problems such as corruption and organized crime. Kate Saffin finds the book to be a detailed history of Italy since its unification, and crucial to our understanding of the country’s current political and social direction. Modern Italy in Historical Perspective. Nick Carter. Bloomsbury Academic. Following the country’s recent elections, outsiders are confused, horrified and fascinated by Italy, and insiders are equally full of mixed and conflicting opinions. How is it possible that almost 30% of those who turned out to vote did so for Silvio Berlusconi, another 25% voted for the comedian Beppe Grillo, while Mario Monti and his technocratic Government, thought by many to be Italy’s best hope and the only leader who has done anything to try to craft a better future for the people of Italy, scored a lowly 10% of the vote? 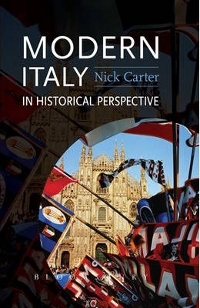 As Europe is faced with the prospect of a familiarly unstable Government in Italy, and is grappling to understand the repercussions of this, both inside and outside of the Eurozone and more deeply for the political and social fabric and direction of all its member states, Nick Carter’s latest book, Modern Italy in Historical Perspective, offers to shine some light on the subject. The author, Head of History at the University of Wales, has published on subjects such as Anglo- Italian relations in the 19th Century and the collapse of the Italian post- war Republic in the 1990s, as well as New Labour and the Euro. He sets out a detailed historiography of Italy since its unification, and shows us how important and moveable the interpretation of historical, political and geographical events are, both to subsequent tussles for power and for our understanding today of why Italy and its peoples think and feel the way that they do. The Italy as we know it today had a rocky start. Carter sets out in detail how unity and independence came to the Italian peninsula in fits and starts, and how the Risorgimento, the social and political movement that pulled together the city states beginning with the 1815 Vienna settlement, gave birth to the Italian liberal period. The final capture of Rome in 1870 was the nail in the coffin for papal political power and a disgruntled Pope Pius IX told the deeply religious Italy that he denounced all forms of “progress, liberalism and modern civilization”. The Pope refused to recognize the existence of the Italian state and urged Italians not to participate in national political life. The significance of this is left hanging as Carter goes on to explore various assessments of liberal Italy, including its oft perceived failure to create a sense of national identity, to bridge the deep divisions in Italian society, and to address the “very uneven impact of economic development on Italian society and culture”. The Marxist perspective that “the inherent structural weaknesses of the liberal state guaranteed its deviation from the normal path of modern state development and ensured its ultimate failure”, is addressed as a possible contributing factor to the rise of fascism when the liberal state did collapse after the first World War. Another fascinating actor in this was Filipo Tommaso Marinetti and his 1909 Manifesto of Futurism. Carter takes the reader through this powerful cultural revolt and the arguments for and against the collaborations, dependencies and tensions between Futurism and Fascism and between Marinetti and Mussolini themselves. How Fascist Italy took shape, its relations with Nazi Germany and the reaction of Marxists who stated that Fascism was an ultimate expression of capitalism, is easily digestible as set out by Carter. The opinions of the most significant and controversial historians and thought leaders from that time and since, including Benedetto Croce, Antonio Gramsci and Renzo de Felice, are also included. The form that the dictatorship of Mussolini took and the cult of Il Duce in which Italians were taught to regard their leader as “omnipotent, omnipresent and immortal” is shown by its mixed effects on the economy and society and culture, with Carter highlighting some of the ongoing debates about the fascist period including “the extent of the qualitative and quantitative improvements, the degree to which the costs of Fascist policies were outweighed by the benefits of those policies, whether improvements were despite or because of Fascist economic policies, and if the economy would have performed better under different management”. Italy’s journey from the fall of the Fascist regime to the rise of Berlusconi is the subject of the last section of the book. The link between Berlusconi and the creation of the Republic after the Second World War has been the subject of many revisionist interpretations, as historians and commentators looked for explanations for the breakdown of the political system that engulfed Italy between the late 1980s and the early 1990s and so questioned the validity of the Republic itself. Carter takes us through what happened step by step and outlines the various factors that could have contributed to not only the changing political apparatus, but to the rise of corruption and violence and links to organized crime that have seeped in to most areas of public life. Carter illustrates some of the more sinister myths and re-workings of Italy’s past which are at play in the current political landscape, not least the picture of Mussolini as a harmless dictator and the rise of “anti-anti-fascism”, and calls from leaders that you don’t have to be anti- fascist to be democratic. Carter makes the point that Fascism never really united the country and it seems as though anti-fascism does not either. What this means for the social and political direction of Italy is profoundly important, particularly when Berlusconi’s most recent result at the polls and political resurrection is reflected upon. How these political movements and results relate to the reinvigoration of the right wing in countries such as Greece and the UK as they and we face economic uncertainty and austerity should also be examined. As we all contemplate the future of the eurozone, it is right that we look to understand the nation that forms one of its pillars, albeit it a crumbling one that represents the single biggest public debt market in the eurozone, has youth unemployment of 36%, falling productivity and rising labour costs, and one that has clearly voted against austerity and EU imposed reforms. Furthermore, how economic instability damages the social and political fabric of any country but particularly the friable Italy is borne out in the pages of history and in Nick Carter’s book. The question is though, are enough people in Italy interested? Dr Kate Saffin has worked as a medical doctor in London, Sydney and Paris and is a qualified General Practitioner. Most recently she completed the Masters in Public Health at King’s College London and has subsequently worked for a think tank and as a freelance researcher in public and health policy. She currently works in a policy role for a UK government department. Her research interests lie in international development and the intersections between health, the environment, economics and politics. Read reviews by Kate.